To share, from Roarmag (31/07/2016), an essay by Theodoros Karyotis on the “leftist” Syriza government’s attack on the solidarity work with migrants of social movements in greece. Most importantly, militant collectives and groups of refugees occupied a host of empty buildings throughout Greece, to be used as self-managed refugee shelters — notably Notara and City Plaza in Athens, as well as Orfanotrofeio andHurriya in Thessaloniki. Other long-existing squats opened their doors to refugee families, including Nikis squat, evicted by police last Wednesday. There is no doubt that the activity of grassroots solidarity movements on a collision course with the project of European integration, which envisions a strict international division of labor, national populations in perpetual competition in a collective race to the bottom, and borders permeable only by capital and goods — excluding immigrant human bodies, which are conceived only as a rightless reserve army of labor at the fringes of the formal economy. To put it bluntly, society is not and should not be the subject of its own liberation; it is rather the passive object of concern and field of intervention for a benevolent government. Social struggles that are not mediated by the state and the parties of the left are either infantile or a threat to social peace — probably both. This totalitarian conception of society, public space and collective action is not new to leftist thought; only in its most recent incarnation is it combined not with state-guaranteed welfare, but with neoliberal dispossession and a state of “permanent exception” — a truly explosive mix. Furthermore, on July 28, just as the detained in the three eviction operations were provisionally freed pending trial, a young Syrian woman was dying of heart failure following an epileptic attack in the refugee camp of Diavata, near Thessaloniki — a death which could have easily been prevented, had there been permanent medical care at the camp, or had the woman been taken to a hospital in time. The death sparked an intense protest at the camp, with refugees demanding humane living conditions. – Violent police evictions of social centers and refugee shelters in Thessaloniki shortly after the No Border Camp. – Greece’s left government executes brutal anti-refugee policies of Europe. – Self-organized spaces are the only secure shelters for refugees. 1) For many years, Nikis was a well known Social Center directly at the inner-city promenade of Thessaloniki. For us and many of our friends, it has been a place of vivid solidarity in times of a general social crisis. Over the last months, the organizers there were hosting refugees. 2) Orfanotrofeio was a squat for and with refugees, occupied since December 2015. The activists have always emphasized that such projects are not set up as idealistic symbols, but out of a pressing daily necessity, responding to the catastrophic consequences of Europe’s anti-refugee policies. 3) Hurriya was the new squat for and with refugees that was occupied during this year’s No Border Camp at Thessaloniki. For the activists, this occupation was an important response to the humanitarian and political crisis created by European Governments. It showed that refugees and antiracists are able to deliver much needed relief. Hurriya was the place – it was accessible, it was set up well, and the first of twelve refugee families already was starting its new life there. The authorities just destroyed those achievements for the sage of maintaining [a hostile public] order. 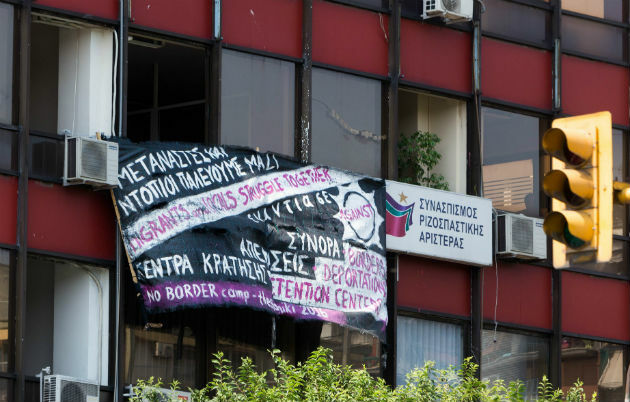 As a response to that destructive eviction, 30 activists have occupied the central offices of Syriza in downtownThessaloniki and stay there until at least tomorrow noon, when a part of the detained people are being led to the judge. Still, we are both devastated and angry. We have to process what just happened, and also assess current developments. It is clear that this massive police assault was a response to the activist No Border Camp in Thessaloniki, which ended only three days before. Most of the 2000 participants from Greece and all over Europeare now gone, and the ones still here are exhausted. So today’s police assault is no coincidence. It is a revenge of a government that saw their inhumane policies challenged on many occasions during the No Border Camp, and by a right wing police force eager to sabotage progressive self-organization. The initial occupation of Thessaloniki University to arrange the camp has drawn a lot of media attention, and was scandalized by right-wing politicians, voicing ridiculous concerns about hygiene and security standards. In our last press release, we commented: “If the officials are so worried about hygiene and security of people, it is remarkable that they never refer to the catastrophic conditions of refugees in the holding centers in Greece.“These politicians and officials have no empathy for the needs and the suffering of refugees that are held captive in the many detention centers in Greece. They are driven by a political motivation to get rid off self-organised places of solidarity between local activists, international supporters, and refugees that are starting to take matters into their own hands. This is why those refugee detention and relocation centers are so far away and so isolated from public life. Hundreds of activists from No Border Camp visited those places, and protested against them, together with the refugee inmates that are forced to live in these desperate conditions. Many of our comrades on the political Left are shocked that this police assault happened under a Syriza government. Although Syriza is officially not in power in Thessaloniki, and is already denying any sympathy for actions like today’s evictions, they are nonetheless happening under their national authority over the police force.Syriza can write as many press releases as they want, at the end of the day, they are responsible: The police in Greece is following orders by the interior ministry or the so called “ministry for public order”. The current Minister of the Interior is Panagiotis Kouroumblis (Syriza), and the Minister of Citizen Protection is Nikos Toskas (Syriza). If Syriza wants to limit the damage that is already done, it must act swiftly and do everything it can to reinstate the social centers and their invaluable work. With so many conservative governments in Europe, and so many right-wing movements on the rise, some people cheer Syriza´s seizure of power, and their promise to be a more humane government. But the fate of the Syriza government over the past year has made it abundantly clear that social progress is not won through elections and parliamentary proceedings. Within weeks in government, Syriza has been reduced to a puppet of EU austerity policies. National laws on property and taxes could not be changed. Once in power, Syriza had to impose those same rules of capitalist law and order once upheld by the right wing. History has shown again and again that political parties and parliaments are ultimately bound to execute whatever seems necessary to guarantee state authority and capitalist growth – with inevitable hardships for all those who do not belong to the demos, and/or are not wealthy enough to draw a profit from the national economy. Our comrades from the Antiauthoritarian Movement from Greece (AK) predicted this tendency when Syriza took over government, calling the Left Party “the party of the defeat of the movement” . Today, this is an evident fact.